It’s a First Friday Giveaway! For March’s First Friday Giveaway I asked y’all to name which school supplies you would need to restock before the end of the school year. I read carefully and I went shopping! 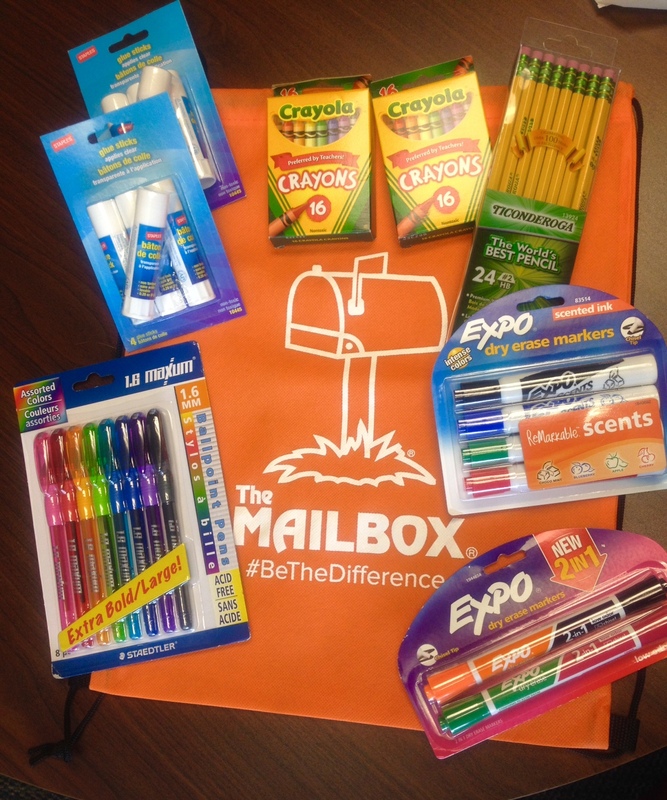 The giveaway prize for this month is an assortment of much needed school supplies. Of course you’ll need to answer a question to be entered for a chance to win those supplies. Perhaps this month I should ask where you’d like to spend your summer vacation and then ……I could join you! Ha! Ha! Do you use videos in your classroom? If your answer is yes, please tell me how you incorporate them into your learning activities. If your answer is no, please explain why. Congratulations to Darcie, the winner of this month’s First Friday Giveaway! I use Bill Nye to reinforce Science concepts. Sometimes Scholastic videos if they go with the lesson. Yes, we use videos to incorporate with the lessons. The videos help to engage their minds. I am teaching Title One. I have a projector in my room, but it is not connected to the computer due to damage in a move. I just finished an Structured English Immersion class and realized not only should I be using the projector, I have to in order to meet the needs of my students. SO I have asked tech support to set it up for next year. I will be using the projector to show videos related to the reading topics- half informational text and half narrative texts in the new reading program, yet to to be determined. I will be showing the students the desert where they live, the Arctic (where Ironically, some of them have lived), the Northeast, where I am from and other environments, animals and anything else they need for background knowledge. I play videos that relate to the standard I’m teaching (from Discovery Education or youtube) and use various teaching strategies each time that help students learn different skills. For example, Snowball Fight is a teaching strategy that uses a fun game to encourage students to determine and communicate the big ideas from a video. Students watch a video segment such as renewable resources. Afterwards, they write one fact that they learned from the video. When they are done, they crumple that piece of paper into a ball, and on the count of three, everyone throw their snowballs in the air. Each student finds and opens one of the tossed snowballs. have had enough of an opportunity to jot down important points from the video. Afterwards, students will share what they have learned in whole group. concepts after watching any video in your classroom. Videos and clips are used to complement what I’m discussing in Language Arts. They also serve as back up reinforcement to complement a given novel topic or movie back up for comparing and contrasting many different topics: Character development, setting influence, theme and the music for setting the tone,etc. I teach mod/severe special ed. We do video modeling with students. I also like to play the BBC Earth series for the students in the background at a lower volume. David Attenborough’s voice is very soothing and calm. Plus, when the kids are between activities, it is something to watch. We also do movies every Friday for star party for behavior reinforcement. Yes, anything that supports content. They are used to illustrate something that I cannot do on my own. They are used to give students access to content experts. Yes, I find that with today’s “generation” of kids, they relate well to electronic methods of teaching. With my 3rd graders, I find Magic School Bus is a real attention grabber for Science; sometimes Bill Nye, although his concepts are a little advanced for my students. Weston Woods videos of “classic” childrens’ literature are also enjoyed by my students. I also have a copy of an old series called “Mathica,” which my students LOVE! yes we use videos in our class we incorporate them with the theme for the week the children enjoy watching the videos. Absolutely! I show videos to support what I am teaching in class. It serves as an example or reinforcement for the concepts presented. I have videos about telling time, multiplication, counting money, science, in addition to stories we have read or are in the anthology. The App “Epic” is great for reading aloud to the students, or just the audio, or taking turns reading! Yes! Like many of the other teachers, I use videos to compliment and enhance what I am teaching. As a school counselor, I use character education videos to complement my character words and lessons. I even have my students create videos about our character words to share with other students and parents. I use Khan academy to reinforce material taught. Absolutely. I don’t do it frequently but I do use them. My favorite is a video of Eric Karl’s books. The kids love it. I show them the video in connection with spring and insects but I do also read them the book version. I love using my Smartboard to play number, alphabet, and sight word bingo games. Also, I sometimes use a video version of a book to compare it to a book I’ve read aloud. I show a lot of video clips that show tours of the oldest house in Boston; the Salem Witch Museum;…The kids get a mini-field trip while sitting at their desks! I use videos for science and social studies. I show videos about animals, plants, seasons, and holidays. ?i like them to be short and informative. Yes I use videos with my preschoolers! I love Starfall for letter practice and recognition! We use videos in our classroom for many subjects. We watch math videos to help teach concepts and reinforce them. We watch science videos. Most everything we watch reinforces concepts and ideas that are being learned. We also love to move to active videos when the kids need a break or just need to get up and move. I use videos all of the time to support concepts that we are learning. My prek mere love Jack Hartmann music videos! I use scholastic videos to go along with my lessons. It helps the students to understand the content of the lesson. I use videos constantly in my classroom, from Language Arts, to Math, and Science. However, Science is the subject where I use videos the most. I enjoy teaching the standards with videos from; Brain pop, you tube, Discovery education, and most of all Skype!. Microsoft has a wonderful website that provides teachers with a plethora of lesson plans, guest speakers, and virtual field trips. I will incorporate the videos throughout the lesson, often they will be my anticipatory set, but most of all they are to engage and reteach certain subjects in Science. There are wonderful videos that are fun and interactive on brain pop and you tube that truly reiterate the concepts I have taught in class. I also use flocabulary for writing and some Language Arts concepts. We are lucky enough to have one Ipad for the classroom with Splash top which allows us to show multiple videos, activities, and lessons. I use videos with my kindergarten students. The Magic Schoolbus helps them better understand some science topics, Jack Hartmann videos to practice sight words and letter sounds, and Gonoodle helps with the wiggles! I use you tube for math songs and go noodle for breaks. Depending on the topic, I will search for videos on YouTube. Then I’ll incorporate them into the lesson, sometimes as a conversation starter, sometimes as a supplement to the information I’m giving. My favorite way to use videos is to help explain something about which the class has a question. I also enjoy using videos as part of movement breaks. Throw on a good music video and let them dance! Sure do! I play videos that relate to science concepts that I’m teaching, or videos with songs to reinforce phonics or writing skills. I also love to use dance videos as brain breaks. Anything to get my first graders up and moving during the day! As much as possible. The students are always engaged. They love Brainpop which acts as a perfect introduction or review of many different subjects! Yes, I use videos all the time in my class. Most recently I used a YouTube video of the stranger. We just finished reading the short story. I used the video for the students to do a compare and contrast. I use videos to introduce new science topics, learn shapes, habitats. I also use them for movement breaks. Another thing I use videos for is when I can’t find the book that I want to read. YouTube has videos of other people reading the books. Love using video in the classroom to support the theme of the week. There are also great sites with video books for when I can’t get my hands on a hard copy. Bookflix and Storylineonline are favorites! I use videos occasionally with my preschoolers – mostly for learning new songs. I use videos to support whatever topic we are talking about. From letters/letter sounds to social studies and science. We also use videos for singing and dancing throughout our day. We love The Learning Station and GoNoodle. YouTube has everything you could possibly think of!! My students are little (preschool) so I use videos they’ll enjoy to tie in with themes. I also use dance and exercise videos for when they need movement. I use videos from brainpopjr, YouTube, myngconnect, and Think Central. I also have a smart whiteboard that I use. I love to be able to incorporate technology in my teaching because it allows me to differentiate and meet the needs of my students better. Plus, they love them! No, we don’t, our center is screen free. Yes I use many multi media features in the classroom. I use a lot of videos to incorporate into my Science lessons to help build the excitement and hook my students. They love clips of braingames to engage them about the nervous system and Bill Nye and Magic School Bus for several concepts. I also introduce stories to my student with read aloud for some books but then I also put the movies into the hands of my students. They have created their one videos and movies on concepts and standards we have addressed in the classroom. My students love how technology is implemented throughout the day. Yes, I use videos to introduce or expand upon concepts I’m teaching. I try to find videos that my students can relate to. I use Magic School Bus and Bill Nye to reinforce science concepts. I use videos to help enhance my lessons. There are great YouTube videos to help reinforce math and ELA skills. I’m able to upload these to Google Classroom for students to revisit when needed. United Streaming is a great resource for Science and Social Studies topics. I use videos in my first grade class to reinforce concepts I’m teaching. I use the Schoolhouse Rock videos and also use a lot of videos from teacher tube! As a Head Start teacher, we don’t have SMART boards to stream videos. But I do have an IPAD where I am able to stream videos on YouTube or PBS kids that is related to the topic I am teaching. We have gone on virtual tours of a humane society when talking about Pets, diary farm, and now the journey of a butterfly. I have also streamed books online as well and songs. As a Special Education self contained teacher, I use videos in my classroom all day. During morning meeting, during whole group instruction, during Science and/or Social Studies. Yes. I know that many of my students are visual learners. They also spend a great deal of time looking at screens, so they are able to focus on any video I stream without much coaching from me. In addition, there are so many interesting sites that draw the students in and engage them with real life examples. I use various sites, including Brainpop, MysteryScience, YouTube, and others. Yes! Many times I use them as activators and sometimes depending on the video as a summarizer as they relate to different concepts. A few sites we use are Brainpop, scholastic, YouTube, national geographic kids, etc. After pack up and while waiting for buses to be called, my students like watching “Making Stuff” videos that show how hundreds of things are made like crayons, potato chips, etc. or we listen to book read aloud a on storyline online.net or Tumblebooks.. Just something fun to end the day with in those last few minutes! We also use GoNoodle videos to expel some energy throughout the day! Yes! I use them to supplement Social Studies curriculum and they are even built into our ELA curriculum, Wonders. My students love them. I use an episode of Magic School Bus most weeks as a reward for a week of good work (my class this year is always asking for Magic School Bus). I also use Go Noodle and Youtube for exercise on inside days. Many of my students come from homes without TV or a computer with internet so any video I play related to what we’re learning is a big hit. Videos work great to introduce a topic in my classroom. Yes! I use YouTube videos to show science concepts. I love the little videos that go with our Scholastic News articles! I also show the occasional Bill Nye if it goes with our unit. Yes, Iuse short videos in my class to reinforce concepts or to introduce new topics. I use videos from YouTube, Scholastic, BrainPop, PBSLearning, and Kahn Academy. My students love Bill Nye, BrainPop and Liberty Kids. Sometimes I show the videos to the whole class and then we have a discussion about the topic. Other times I will include a video in a google classroom assignment. Yes! I teach English as a Second Language and one of my favorite (and the students’) things to do is watch music videos. We analyze the music, the words, the dancing to practice English and vocabulary. It is so easy to differentiate for all of the ability levels I have at one time. Yes, I use music and movement videos when it’s raining as well as videos that help the students grasp what we are talking about. There are so many options now with you tube. Discovery Educ videos for science lessons, Brain Pop videos for science and social studies. No, we are not aloud to use tv, videos. ???? I use videos in my classroom. I like to use them in science to compliment lessons. For example, I did a “Pollution Dilution” Lab with my students. After we did the lab and talked about pollution, I showed them a Scholastic Video about the Gulf Oil Spill and about the Great Pacific Garbage Patch. This showed the students a real life scenario about water pollution and its effects on the environment. I use the Big Word Club videos in my classroom each week. I also look for first-grade appropriate videos for areas we are studying. For example, when we did Christmas Around the World, we watched a video of how wooden shoes are made, how candy canes are made, etc. The students love those “real” videos. We also incorporate sign language videos into our classroom. I use videos, usually Bill Nye for science. It makes the lesson interesting. Even though I love science, once I run out of experience to, I just can’t get excited about it, so I use Bill Nye. I have also tried putting on Khan Academy videos for math, but those are less popular. Yes, I use a lot of math antics to introduce or review math topics. Yes- I usually use them when they correspond to what we are learning about in science. My kids love to watch bill nye or the magic school bus. We were recently learning to write book reviews and I let them listen to a couple of book reviews at the end of the reading rainbow episodes. They loved hearing book reviews from real kids! Yes, I try to use videos to introduce and reinforce what I am teaching. I use them for EVERYTHING!!! I especially love when I can find videos that have a catchy song that we can learn!!! Yes I use videos to reinforce concepts I am teaching, especially for science and social studies topics. It helps my students to “see” the concepts better. Absolutely! It varies depending on what I am doing but sometimes I introduce a lesson this way, I sometimes reinforce a topic or revisit it with a video. I have done this for any and all subjects over the years, including math, reading, writing, science, social studies, health and even art! They love it and it is a great way to reach students in a different way. Depending on the length of the video I will play it more than once so that they can always try to get that much more from it. I love doing read alouds with them and then finding the movie to compare and contrast or a website that is connected. I will have them turn and share what they learned from watching this video, with a peer or I may ask questions and call on students for their answers. It is great to hear their answers and see them engaged. Yes, I do. I use Science and Social Studies videos to help my students visualize concepts that are difficult for them to understand. I also teach in a small town that has a high poverty rate. Many of my students have had very few life experiences, and videos often help them to understand what we are studying. I play ‘vintage’ Reading Rainbow VHS! I love having the book that is highlighted in each episode. The kids are amzazed that they are real books they can touch! I use magic schoolbus and bill bye video snip its to reenforce concepts or show hard to explain ideas to my science kids. Yes! I use videos for dance parties, to teach learning songs (especially in math), to complement lessons, and the occasional “just for fun” reward videos. I also use the videos provided by Scholastic with our weekly Scholastic News issues. I occasionally use videos in my classroom, not as often as I would like. I teach in a small Christian school and we are limited on resources. There are times I am able to connect my computer to a TV and show educational videos. Yes, our curriculum is online and the videos are embedded in the lessons. We also have access to a large amount of websites that offer videos that are approved by the school system. Yes. I use BrainPop, Study Jams, and videos from YouTube that are appropriate. Yes, I use all sorts of videos to teach/reinforce various concepts. I really like sing songy stuff that helps them to remember things! Not very often because my Smartboard acts up:( I occasionally use the interactive games that came with the textbook. We use Peg and Cat videos in our classroom to enhance math lessons. Our class is involved with a study with PAEYC, PBS, and the Fred Rogers Center and we have been given so many resources! I use Mystery Science. It has wonderful videos and activities. I also use Scholastic StudyJam for science related videos and slideshows. I also use a lot of YouTube videos for Social Studies. I use videos if the correlate to subject we are studying such as Butterflies, we may watch a video that shows the metamorphis stages of caterpillar to butterfly. I also have special movie days for major holidays! I do use videos in the classroom. Being a Special a education teacher many times I need a visual lesson for my students and so I try to find videos that are easily understandable to my students, videos that engage my students, and videos that correlate to what I am teaching or re-teaching. Videos also break up the usual drum of teaching and can give students minds a break from looking in a book, at a black board or white board, or from a teacher lecture. I use PBS Kids videos such as Word Girl for vocabulary reinforcement in a fun way mostly as an indoor recess activity. I also use Reading Rainbow, Sid the Science Kid, and Magic Schoolbus for academic purposes. I use some 3 act videos to teach problem solving. I teach preschoolers, the only time I would use a video would be to enhance a science lesson. Yes, daily. I use them for brain breaks, science videos, math videos, online books, songs, and anything else that I can find to engage the students. I use videos to make learning more meaningful, especially for my students with limited life experiences. They need visuals to connect the images they are reading about. I also connect and compare lit studies with movies on the books. It leads to great conversations! Yes I use videos to go along with the content I am teaching! My kids favorite videos are their phonics songs for our reading program that have fun dances with them! They ask to them everyday! I teach PreK ESE and we use a lot of videos for music and movement. I use the Crash Course channel on YouTube for high school science. There are so many topics covered in fast pass lessons. They are great for review or reinforcement. I use videos all the time. Kids love to watch and it helps them understand difficult concepts. We watch videos showing fhe life cycles of different animals, we watch videos about math concepts, and so much more! Yes! I show videos that are based on a chapter book. We can do compare/contrast activities between the video and book. My students love to see a book we read come to life in a video! Lately, we have been excited about the DC eagle cam. The anticipation for the eaglets to be born, and now watching them being fed and growing is so amazing! We also watched the sea turtles find their way to the sea. It is great to actually see the animals in action, rather than just read about them. I don’t use videos often because of time constraints. If I find a video clip on youtube that really accentuates what I’m teaching, then I may use just a short segment (3-5 minutes) and move on. Sometimes, if I’m teaching a novel and there is a movie version of the novel, i will show it and use it as a “compare/contrast” activity with a Venn Diagram to compare/contrast the book and the movie. The students ALWAYS say the books are better which is GREAT to see them realizing! They get so upset when their favorite parts of a certain book are not in the movie or when extra things are added to a movie that was NOT part of the book! I love seeing them discover this truth for themselves! Yes, absolutely use many different types of videos to support concepts taught in my 3rd grade classroom. Some of my favorites include, Learnzillion, Kahn academy, scholastic, story online, class dojo for growth mindset and character education videos. Yes. I teach early childhood special education. We use music videos for preschool for movement and we use videos of children’s books being read aloud when we don’t have access to the book we want to read for our theme. Yes! I use videos in a variety of ways…as an introduction of a new topic (brainpop jr) as reinforcement (old school phonics lessons from Electric Company, grammar from Schoolhouse Rock and Grammaropolis etc), music videos to build memory ( multiplication facts, doubles rap addition facts etc), as direct instruction (mysteryscience.com) and to flip the classroom or for tutorials/at home assistance (Kahn Academy), and as culminating activities and supplemental materials ( Discovery ed, Magic Schoolbus, Reading Rainbow). I use BrainPop videos and other short (try to limit to no more than 4 minutes) to reinforce concepts in ELA. I think videos give the kids something to connect to the content. Yes! We use Drive Thru History. It brings history to life in ways that a textbook doesn’t! We have also used Crash Course History lessons. Yes. I use them daily as counting videos, new phonics concepts, & new material introduction. Yes, I use videos in my classroom daily! I teach fifth grade social studies. Schoolhouse Rock still rocks when reinforcing content regarding the American Revolution, the Declaration of Independence, the Preamble, and Manifest Destiny. On Mondays, I deliver a #MCM lesson on an American male hero in history, and biographical videos from biography.com, Discovery Education, and YouTube are always incorporated into these lessons. Each Wednesday, I teach a lesson on an amazing American woman, or #WCW. During these #WCW lessons, I use all of the video sources previously mentioned, as well as Flocabulary. My students can’t wait for school on Mondays and Wednesdays in anticipation for the focus of our #MCM and #WCW lessons! No, I do not use videos in my classroom! I am a preschool teacher, my program only goes for 3.5 hours a day. I honestly don’t have enough time to play videos. I was taught in college that I should not use videos in my classroom of young children. Children need to spend their time freely playing, socializing with other children, and having plenty of age-appropriate activities that support positive development. I often show videos to launch a lesson to help the lesson be more engaging. In the library, I often use videos to support the curriculum. I always try to find a video to get my young students the chance to move around. They need to move around to help them remember what they learn. One of their favorites is the Harry Kindergarten song distinguishing fiction from non-fiction. We have a digital component to our curriculum that I use sometimes. My class also loves GoNoodle!! Yes! I try to use a video or song for every lesson that I teach. The logic behind this is that it helps those students that are visual learners. Students also make connections by watching it. Yes, we use them occasionally to enhance our learning topics. Yes! I use BrainPopJr.,Go Noodle, and YouTube for listening/watching stories! I use the IPAD to help support the book that we are reading. My students with special needs have a hard time connecting with the just the book, so I use the video to help them understand the concepts and vocabulary. I use short videos frequently that associated with my textbook series. With my math series there is a video that goes along with each lesson. I also use the StoryWorks, Jr. from Scholastic, and there are videos with almost every story. The students enjoy listening and viewing someone different than me all the time. Omg….where do I begin? Glue, glue sticks, and dry erase markers. I’m sure there are more, but that’s the most urgent stuff!! Oops, I answered the wrong question! Yes, I use videos in my class. I use the ones that are connected to our reading and math, our scholastic news, go noodle, and sometimes random you tube videos. Yes. I use the short educational videos that go along with our Scholastic News lessons of the week. I also use some videos from United Streaming to supplement our science and social studies lessons. We use these videos to help with Grammar, Social Studies (over famous places or people), & even Math!! This really helped the kids understand what families go through and then we completed a writing assignment and wrote letters to the father of the child in our classroom. This is just one example but I feel there should always be a purpose and a lesson to go along with the video…unless it is is the day of Christmas break and you just need to show something to keep all calm!!! 🙂 Thank you. All the time. I love BrainPop videos to help reinforce concepts being taught. They have great videos for all subjects. I also use videos for brain breaks like GoNoodle. I even find books being read on video. It helps spice up the daily lessons and the kids love it. Yes I use videos to reinforce content that I am teaching. I really like Bill the Science Guy. Yes! I use brain pop videos very often. I also use clips from movies to reinforce concepts in ELA. I often use a YouTube video for introducing a math concept, to reteach something, or to have a song kids can use to remember a formula or procedure. My favorite way to incorporate videos is to enhance-dig deeper into a text we have close read. For example, when reading about the challenger explosion we watched it, when we read about the high wire walk between the twin towers we watched it. Yes. We watch Magic School Bus, The Cat in the Hat Knows A Lot About That, Mr. Roger’s, sight word videos and more. I try to let them see what I am talking about in science instead of just pictures. Mr. Roger’s helps a lot with social studies and skills. Yes I use YouTube videos for action and movement songs to get the kids up and moving in between learning time. We also do weekly readers and so I will often use the short video that they have that goes with that weekly reader to help introduce the topic and to get them excited about it. I teach transition for kindergarten with preschool kids and they are very curious and enjoy visually seeing how things work or a life cycle or real pictures about someone we’re talking about etc. I love trying to incorporate technology. Yes– I generally try to use ones from the Scholastic magazine for the week as well as incorporating some science/ social studies ones from Discovery Streaming in my lesson plans. It’s not a constant so it keeps the class engaged. Oh yes I do in my science classroom use videos. I use bill nye and you tube all the time. I think a visual always helps out for some topics that are hard for students to learn. This is an awesome prize and would love it for my classroom!!! I use videos all the time. I use BrainPop, movies, YouTube video clips, teacher tube video clips, and khan academy. I use all this to connect concepts that are being covered with concepts already covered. Plus it adds a different learning modality to the mix. I do use videos in my classroom. I use the ones that are attached with curriculum. As well as any that support curriculum. This has really helped all of my students but especially Ell and SPED students. Yes, we do use videos occasionally, and only to show them things that we wouldn’t be able to see in our environment. For example, the last video we watched was of a caterpillar entering its chrysalis – the video was beautiful and short enough to sustain their attention. Yes. I only have an iPad to use in my classroom, so I usually only do it when I have smaller class days. I will show YouTube videos mostly for science: volcanoes, worms, plants, life cycles. Yes, I sure short video clips to teach social skills in my special education classroom. Yes! Any age appropriate video that teaches a concept I am teaching is an option to use! I love videos because it captures their attention and can provide another way to explain a concept that I have already explained. Our math program has a video with each lesson. Kids love it!! I use Gonoodle for brain breaks, and I often use Learn360 videos for a variety of subjects to make connections with our curriculum. I use BrainPop Jr. To introduce and reinforce math concepts, GoNoodle for brain breaks, Magic School Bus videos to reinforce the concept I’m teaching, YouTube videos that go along with whatever I’m teaching…suffice it to say I use videos in many situations in my classroom and the kids love it. We have PBIS in our school. One of my classroom incentives is to offer a video if the class earns the class behavior points. It usually is a video related to our weekly topic. I also use go noodle with most of my classes as a daily incentive. If class behavior is good, they get five minutes of go noodle at the end of class. My ultimate answer is, No, I do not use videos in my classroom. The reason I do not use video is because we don’t have much in the way of updated technology in our center. However, for our morning time my class loves to dance so I am constantly looking for audio visuals for our ‘dance time’. Recently we studied space and I shared some videos from the web browser on my phone. They loved it! I have used them to science to reinforce/ illustrate a unfamiliar concept, in reading to give backgroynd knowledge or compare a story to the book version and in math to provide another method or algorirhm. Yes! I try to incorporate videos into science and social studies especially when learning new content. Billy Nye is our favorite for science and Libertys Kids videos are right on target for our Social Studies standards. Of course there are short clips and books read aloud on video as that I incorporate into other subject areas. Sometimes we want uses certain book for content in ELA and I might not have it (actually happens pretty often) so I find a video of it being read aloud. We don’t have a TV so all the videos are found online and projected on our SmartBoard. Yes I use videos occasionally. We watch the animated math videos with our Math lessons, Gonoodle for brain breaks, sometimes YouTube, and occasionally a movie if it goes with something we are learning. Like last week our Reading story was Cinderella, so on Friday after our tests, we watched the Disney animated movie of Cinderella. Yes, I use Brain Pop Jr., Flocabulary, Discovery Education, etc. I’ll use a video or video clip to introduce a new concept or to help my students gain a better understanding especially in Science & Social Studies. I use YouTube to find videos of the nursery rhymes my kids are learning. Gives them added incentive and helps them to recall the rhymes even when the videos aren’t playing; parents come to me all the time saying their student is singing our rhymes at home! Yes! I use YouTube, Scholastic videos, The Learning Station, and ABC Mouse just to name a few. We use them for “brain breaks”, music and movement, or to compliment and enhance a lesson. YouTube has amazing songs and dances to reinforce kindergarten math skills! Jack Johnson, The Learning Station, Silly Bus..and so many more. Hello, We use lots of videos! There are many on YouTube that we use for Brain Breaks. We also use Discovery United Streaming’s videos which include Magic School Bus. I add videos to my Google form quizzes to help students learn or review the concepts. I use the Scholastic My Big World videos, I love them. They are perfect for preschoolers. I use videos/dvds to reinforce content or to visit places we are studying. Yes! I use Bill Nye and Magic School Bus for science concepts. I like Study Jam since I teach both Math and Science; the students can interact with some of the videos. For math, I also use Khan Academy and YouTube’s Numberock videos to help with math concepts. We use videos for rhyming words and brain breaks! I use videos to help practice the letter sounds. I am the director of a preschool. We use videos very little but will have a ” popcorn and movie” party with short themed movies on special occasions like Thanksgiving or Christmas. We use tons & tons of videos, including Ted Talks! Yes a lot of exercise videos especially on days we have to stay inside. I use video clips as journal starters. The kids love video journals! I also use them for brain breaks and to reinforce concepts. I use videos from Brain Pop Jr. to enhance whatever we are learning. I recently used some nutrition videos. My kids love them! I am a Special Education teacher. I use videos all the time. From letter sounds, parts of speach to various science and social studies topics. My students love watching a video in the classroom as it gets them excited to learn. Yes, when I can find a video of the week’s current book we are studying. I prefer those that have the words on the screen or have closed captioning available. This makes it possible for my students to read the book along with the video. We also use short exercise videos for brain breaks and inside recess. I use videos in our classroom daily! We love to watch and listen to alphablocks, Geraldine the giraffe, and old school School House Rock to supplement our Phonics Workshop instruction. We always have time for Go Noodle for brain breaks throughout the day and I also use the videos for our school’s Discovery Education subscription for Science. Yes, I use videos in my classroom. I incorporate them with our Weekly Reader subscription, for our Science curriculum, phonics videos when introducing new letters/sounds. Yes I use videos! Reinforce the letter of the week, story on line, gonoodle, research for writing and sometimes just for fun! I use videos that support my curriculum, Scholastic News videos and YouTubes to clairify a skill or concept. I have many that I have embedded into my Mimio slides so they are ready to go at the tap of a stylus….an important feature with First Graders! I use videos to reinforce different concepts that they are learning. I LOVE using videos in my classroom. The enhance the student learning because it provides another method of instruction! Videos are amazing! Yes! I use videos in my classroom. We use DIscovery Education in our district and we can access full videos, video clips, pictures, and other forms of media at the click of a button. All contents are district approved and appropriate content for students. We also use BrainpopJr.com, Storyline Online, Tumblebooks, School Tube, and carefully previewed you tube videos. Students are interested in seeing the video as it appeals to visual/auditory learners and this generation of students are media-driven and seem to thrive on anything that is different than printed resources, project based work, etc. Thanks so much for all you do to help teachers. It is such a blessing to have support from other areas, teachers love the opportunity to share information and learn from one another and giveaways are a big bonus. Happy Easter!! I use videos with the children everyday. we use whatever educational. it is amazing how many videos that you do not think of as educational that are. It is interesting to see how the children seem to beam when they see that they are learning while they are having fun. Yes we use videos that are attached to our math program. We also use videos in our science lessons to show things in nature that we couldn’t otherwise see. Yes, I use them in many ways. I go on YouTube and find videos my kids enjoy like Popseeko and other GoNoodle videos for exercise. I use videos for fun math raps songs or instructions math videos. I use it for grammar rap; then, I write a Google Form and place the video in the form for students to learn from. Science and animal videos for students to learn about their world. Art and drawing videos for directed art lessons. Language videos for teaching Chinese. I love 2-5 minutes videos that get kids interested in a subject. I do every once in while show the Snowman, I own it, Or a video like “The Present” because it opens up communication. I use youtube to teach students about phonics, academic topics such as the water cycle; local news such as flooding as we study about weather, virtual field trips, GoNoodle for body spell, coordination exercises, relaxation techniques, and just getting up to move. I use BrainPop Jr mini videoclips to enhance morning circle discussions when I introduce a new theme or concept. The videos along with pictures and props help students retain new vocabulary terms. I also use YOUTUBE videos to demonstrate a Day in the Life of… when I am unable to retain a guest visitor. For example, the children watched short videos about a construction worker, workers using simple machines, an arborist, and a sanitation worker. I use Book Flix to teach the difference between fiction and non-fiction to Kindergarten and 1st grade.